Billy Horschel shot an 8-under 64 in the final round of the Zurich Classic, maintaining his composure through two weather delays for his first-career PGA Tour victory Sunday. 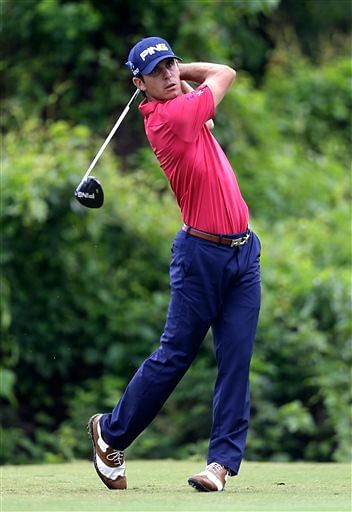 Kyle Stanley shot a 5-under 67 to finish third, while Chinese 14-year-old amateur Guan Tianlang finished 71st after making his second cut in two PGA events, the first coming famously at the Masters. Horschel sealed the win with a 27-foot birdie putt on 18, after which he pumped his arms and screamed in triumph, before sinking into a crouch and briefly pulling his cap over his face as the crowd roared. Although Horschel had never won on the Tour, he had been playing the best of his young career lately, with three top 10 finishes in his past three tournaments — tying for second in Houston, tying for third in San Antonio and tying for ninth in Hilton Head Island, S.C., a week ago. He has also made a PGA Tour-leading 23 straight cuts, and had already earned $1.3 million this year. Now he has nearly doubled that, thanks to a final round which tied a single-round course record that has been matched several times, including by Rickey Barnes in Thursday's first round. Horschel began the day at 12-under, two shots behind third-round Glover. He began to make his move up the leaderboard with his first birdie on the fifth hole. His string of six straight birdies ran from seventh through 12th holes move him to 7-under on the round and 19-under for the tournament. On the par-5 seventh hole, Horschel chipped from about 89 feet to within 2 feet to set up his first birdie putt. He made a 9-foot birdie putt on eight and then hit a 191-yard tee shot about 4 feet from the pin to set up a birdie on the par-3 ninth. He made a birdie putts from 13½ feet ( 4 meters) on 10, from 6 feet (2 meters) on 11 and 15½ feet (4.5 meters) on 12. Horschel bogeyed 15th hole after twice hitting in the right rough to fall back into a tie with Points. But Horschel then birdied 16 by hitting a 109-yard approach within 5 feet, putting him back at 19-under and restoring his one-shot lead. Points, playing in the same crowd-pleasing group as Horschel, birdied the 10th through 13th holes to stay on Horschel's heels. However, he left a 98-yard approach shot 30 feet (9 meters) short and left on 16, where he lost the lead. Glover, the 2009 U.S. Open winner who was looking for his first Tour victory in about two years, took a two-shot lead into the final round and opened with five pars — narrowly missing birdie when his put rimmed out on the first hole. He was about to line up a birdie putt from 27 feet when a horn sounded, signaling nearby lightning. Play was halted immediately and a downpour ensued shortly after, causing a 2-hour, 54-minute delay.